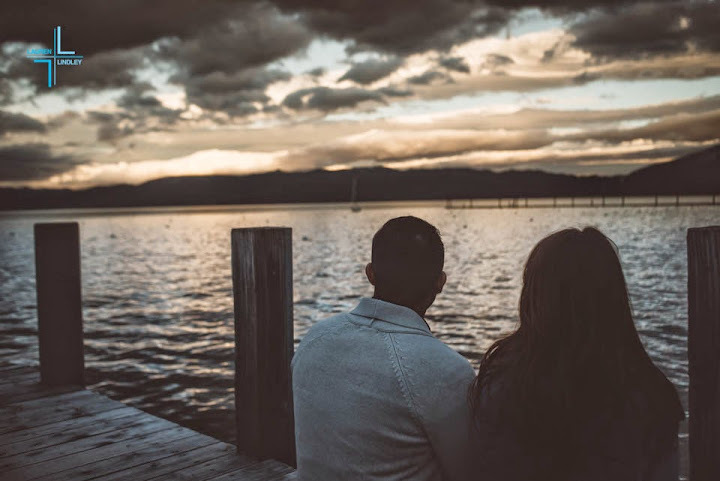 Making your marriage proposal meaningful by taking her back somewhere special to the two of you is an awesome way to go, especially when it’s a place that will always be there. Like Lake Tahoe – whose massive features and pristine waters aren’t apt to disappear anytime soon. 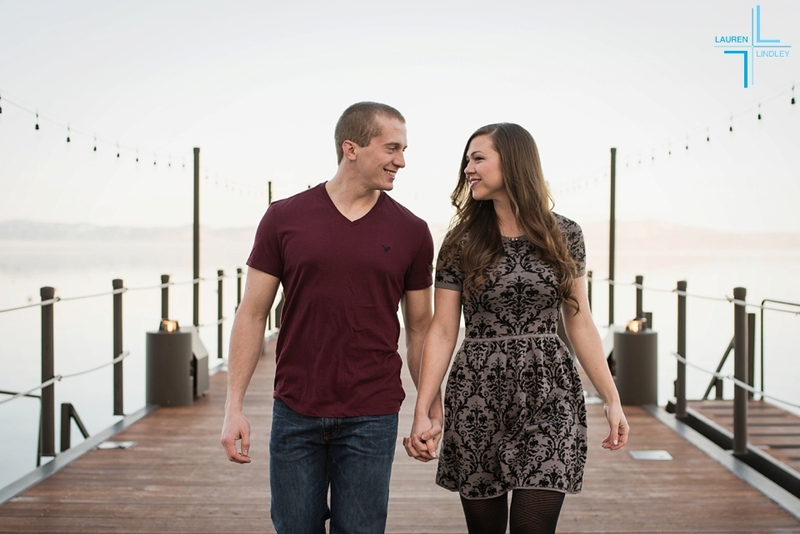 It’s unlikely that anyone will even be around if you plan a Tahoe winter proposal like Erik did for Alex. There was nary a soul in sight when he went down on one knee on the pier at Edgewood Golf Course. Kyle had to wait a LONG time on bended knee. It was an incredibly blustery day. A snowstorm bringing 12-16 inches of snow was blowing into Tahoe just as Kyle bent down to patiently await his bride-to-be’s reaction. The wind was howling relentlessly. Madeline was pre-occupied taking photos of Emerald Bay and she couldn’t get her phone to work. After what felt like minutes while I giggled under my breath, she finally turned around and of course, said yes. 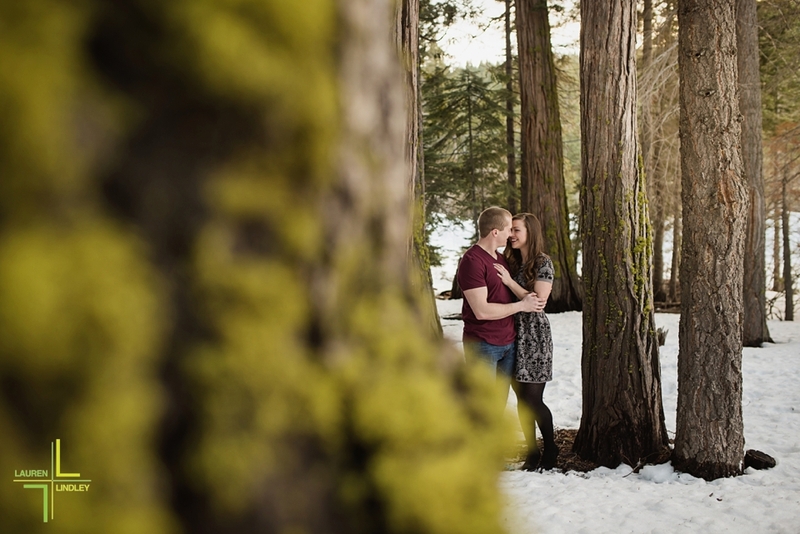 To escape the wind, we left Emerald Bay State Park and headed down to explore the Taylor Creek Visitor Center for a quick engagement session which was thankfully significantly more comfortable than it was up in on the ridgeline! I’m excited for this awesome couple of five years and their future together! 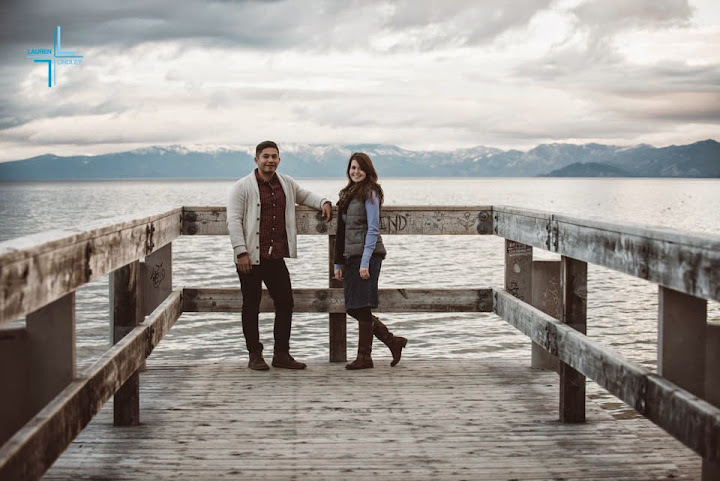 Are you planning a Tahoe winter proposal? Hiring a professional photographer is a great way to have your special moment captured and secure awesome save-the-date photos all at the same time! I’m happy to help you come up with a plan and a location. It’s always good to remember that Tahoe roads can close in the Winter so back up locations and realistic expectations are always recommended. After all – there could be a snowstorm blowing in that day! 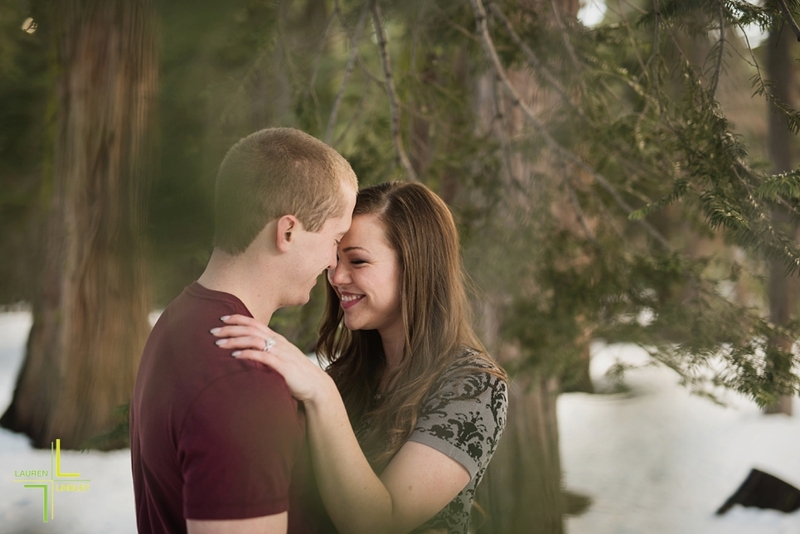 Tahoe wedding proposals are one of my favorite things to photograph. The nervousness is heightened to a scale of 11. The logistics are a *smidge* harder. The excitement and promise of a different future is unbounded. Ladies, there are men out there who love you so much, that they plan ahead, and in some cases, months and months ahead. It’s endearing and wonderful to be part of. Zack is one such guy. He and Alexa were highschool sweethearts and he contacted me in June for a proposal in October. He asked her parents permission and fretted over the location. After much deliberation, we collectively decided that a Sand Harbor marriage proposal was in order. That day brought cold temps, some rain and snow flurries and incredibly beautiful skies. 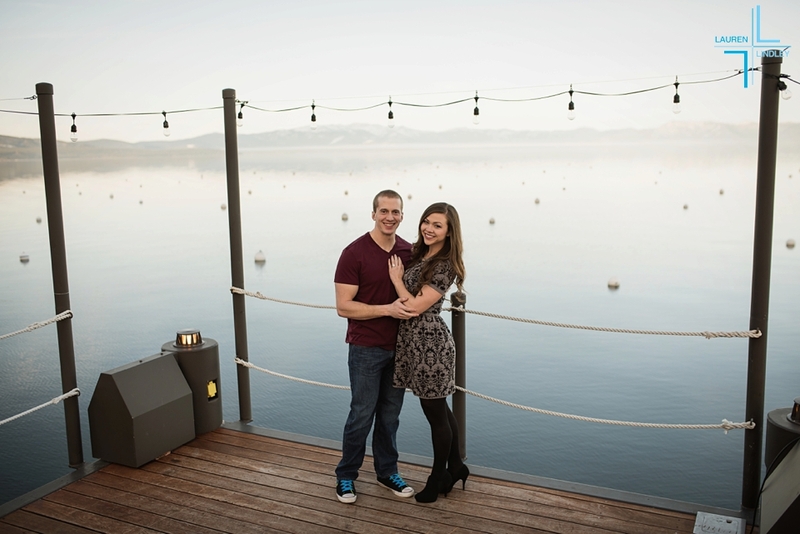 When Steve originally contacted me about his Lake Tahoe proposal that he wanted me to help him with, I was ecstatic. 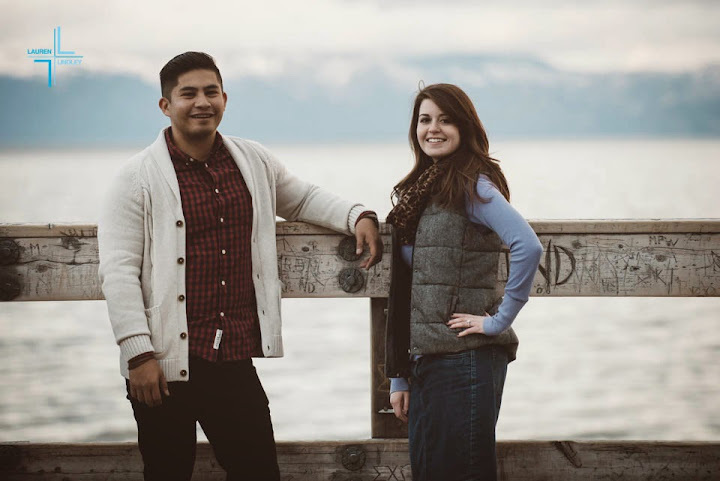 His original idea was to propose on the pier adjacent to his Tahoma bed and breakfast that he’d booked for his fiancé-to-be and himself. I suggested that the West Shore Cafe pier might actually offer a better vantage point (and incredible pier) and he readily jumped at the chance. Conveniently, they were closed for dinner that day and he simply lied and told Charis (like Paris and which, if you are interested in the origin of words as I always am, means grace, favor, and kindness in Greek) that he had planned to take her to dinner there. Pretending to be disappointed that the restaurant was closed, Steve suggested that they at least walk out to their pier and take a peek at the lake since it was almost sunset and there I was waiting, taking photos of the lake. She, of course, said yes and I am eternally grateful to these two, who were adventurous enough to tromp around in the snow with me for photos in the woods and whose infectious spirits were such a joy to capture. My favorite thing about photographing wedding proposals is that the girl never things ANYTHING of the fact that there’s a couple of people standing around with really nice cameras. Jess had NO idea this was coming – clearly – as you can see by this really incredibly amazing photo. The best part was that she was actually so incredibly surprised that she held this position for an extremely long time, which made my job significantly easier. 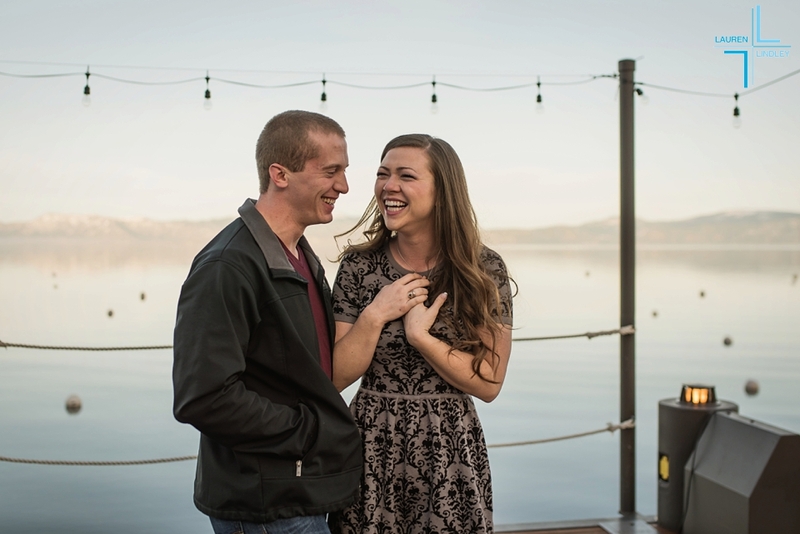 Adam proposed to his girlfriend of 4 years on the first night of their Tahoe South vacation on the pier outside the Tahoe Beach Retreat & Lodge and of course, she said yes! Big thanks to Austin Costanza of Tin and Toe who came out to help hold lights and do a little bit of second shooting for me! 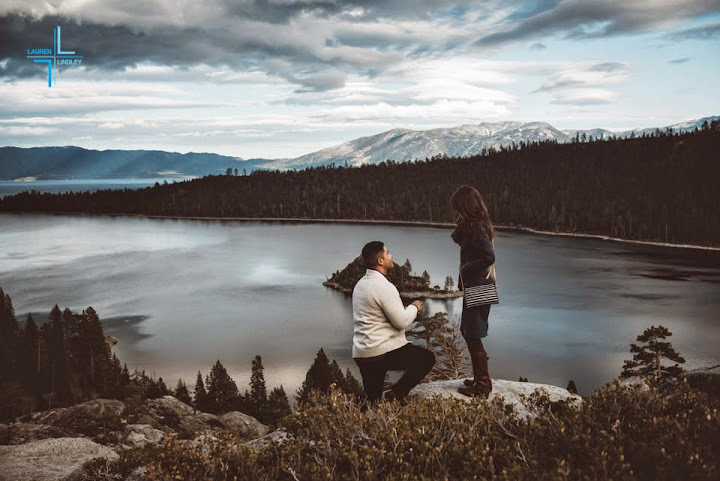 Jad chose to propose to his girlfriend Melissa in one of the most beautiful places on the planet: Emerald Bay State Park. 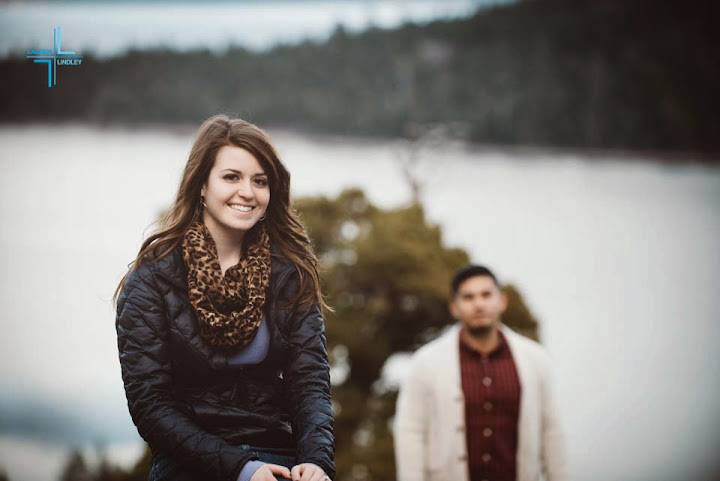 When he contacted me about photographing his Tahoe wedding proposal, I readily agreed. 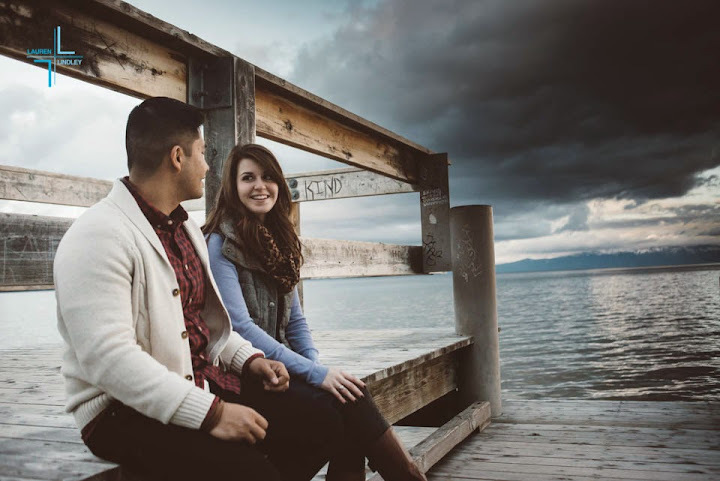 Jad and Melissa met in the school they both attended, a small private Baptist college. Their faith is extremely important to them and as such, they follow rules of courtship to maintain chastity and purity. “Now regarding the matters of which you wrote: It is good thing for a man not to touch a woman” (I Corinthians 7:1). 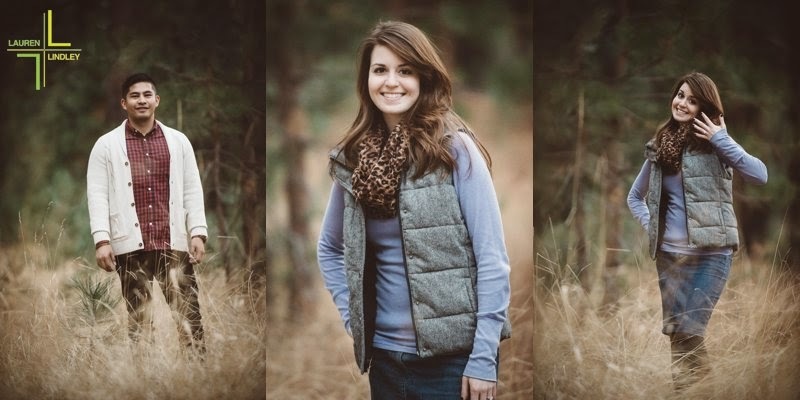 As such, their short, sweet portrait session doesn’t involve any photos of the two of them touching. They are a gorgeous, vibrant couple full of love and adoration for each other and I’m so thrilled I was able to photograph their day. I am certain these two are going to have a long love filled life full of mutual respect and joy together. “You make known to me the path of life; in your presence there is fullness of joy; at your right hand are pleasures forevermore.” (Psalm 16:11). Jad originally called me from the Bay Area. He wanted to plan a weekend getaway for his girlfriend Melissa and propose to her while he was here. 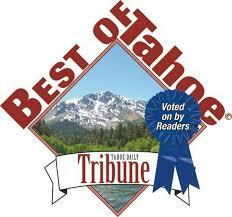 After discussing option, he picked the most picturesque location in Tahoe for the location: Emerald Bay. 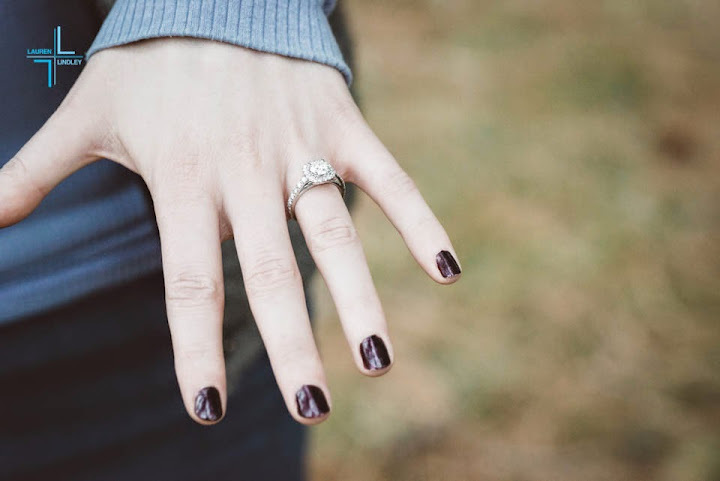 Here’s a sneak peek from their Emerald Bay proposal. More to come from this adorable couple later!